1913 Bath House Inventory, p. 130, no. 650, in the safe. 1914 Wernher Inventory, p. 86, no. 434. The engraved scenes are taken from Hans Sebald Behams' series, The Labours of Hercules (Bartsch, viii, pp. 157-158, nos. 96-107). The prints are signed by the artist and dated between 1544 and 1548. A particularly fine set of the twelve prints was formerly in the collection of Gordon Nowell-Usticke (sold in these Rooms, 28 June 1978, lot 60). Hans Sebald was born in Nuremberg in 1500 and his brother, Barthel, two years later. It is possible that they studied under Dürer who also lived in Nuremberg. Hans Sebald's earliest prints appear to date from 1518 and strongly reflect the influence of Dürer's style and technique. The brothers were influenced by the religious doctrines of the reformers Karlstadt and Munzer who were exiled from Nuremberg, and they themselves were expelled for seditious remarks against the church and city council in 1525. Hans Sebald visited the city periodically and moved to Augsburg, Ingolstadt, Munich, Frankfurt and Mainz before finally settling in Frankfurt in 1535. During these years he worked for Cardinal Albrecht of Mainz and established a close relationship with Christian Egenolph who set up the first printing-press in Nuremberg. On 14 October 1540, he became a citizen of Frankfurt and married, for the second time, in 1549 but died that year. He produced a series of drawings of the Passion intended for use on glassware, while his ornamental and frieze designs were widely used by goldsmiths and ivory engravers of the period. He is also known to have carved designs in soapstone and illustrated two prayer-books with miniatures. Beham was thus a classic Renaissance artist, able to turn his talents to any commission. The finial is similar to that surmounting the Martin Welcome Cup of the St. George Brotherhood of Ebling now in the Altonaer Museum, Nord-Deutsches Landesmuseum. 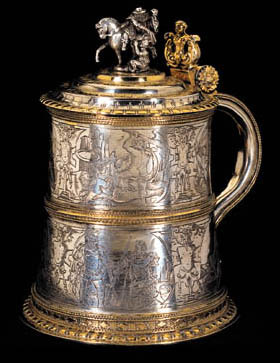 This cup was made by Hans Beutmüller in Nuremberg in 1604 (catalogue of the exhibition, Wenzel Jamnitzer und der Nürnberger Goldschmiedekunst 1500-1700, Munich, 1985, p. 261, no. 86).